Apparently the same as these http://bugguide.net/node/view/74737/bgimage, that have not been identified to species either. These are common to abundant in the foothills of the Sacramento, and Organ Mountains, in southern New Mexico. I have begun some work on Cauliognathus here at the Museum of Southwestern Biology at the University of New Mexico. Based on what I've learned, this is a photo of Chauliognathus discus. It fits Fender's 1964 key from Northwest Science perfectly. Amazing! Not only are the variations stated in the key seen here, but this one has the abdominal segments entirely pale, as opposed to the mostly black segments of the other C. discus currently posted. Thanks for getting this one to a proper determination. Given your access to the Museum, any chance you could photograph / post some of the other southwestern species from this genus that we have yet to see here on BugGuide (or to my knowledge, anywhere else on-line)? From Fender's paper, those species would seem to at least include C. arizonensis, C. werneri, C. deceptus, and C. transversus. You're welcome. We've been talking about these images in the museum. Hopefully I got it right. One never knows. There may well be some undescribed or cryptic species out there. We need to get some specimens of this population from southern New Mexico and examine them more closely. My interests are primarily ecological but I have really good taxonomic help. I will do my best to submit some images of species that are not yet represented on BugGuide. It will be fun. here's the key (at end of paper) if anyone wishes to try. 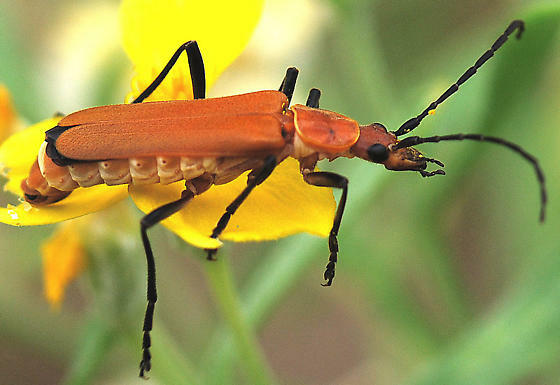 i have obtained pics of a bug that looks nearly identical to this from a friend who took it in Uvalde County, Texas; using a huge version of the pic, i tried the key, and it points to C. discus, but a bit unsatisfactorily. i too wonder about C. flavomarginatus . . . does anyone know a source of a picture or accessible description of that taxon? would appreciate being kept posted if anyone comes up with an identity on these NM pics . . .
Posted this pic from uvalde along side the other Chauliognathus sp. I had no luck with the key. The areas I know these to occur are very close to the Mexican border, so it might be primarily a Mexican species. I wonder about Chauliognathus flavomarginatus, that it mentions in the key...sounds similar, but I could find no other information. to my experience trying to use the key on Jim's Chauliognathus that you thumbed as similar looking to your own. Hopefully someday an expert can determine these. Alternatively, if someone with access to a southwestern university collection could image the few species that are not currently in BugGuide nor available on the www, we might solve the mystery ourselves.